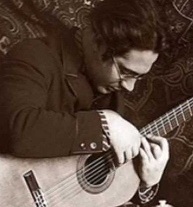 Andrés Segovia is without peer as a classical guitarist. He created the concept of the guitar as a concert instrument; and then, through masterful execution of pieces by Bach, Tárraga, Albeniz and others, proved his concept valid. His technique evolved to meet the needs of the complex pieces he played. Using fingernails to pluck the strings, for example, rather than merely brushing with the fleshy sides or tips of the fingers, he added another dimension to the tonal range of the guitar. This was largely an innovation of Segovia's. The most striking aspect of the man's playing seems to me to be the combination of suppleness and precision of his hands. They seem to be totally relaxed yet have the dynamic tension to play arpeggios or complex barre chords flawlessly. Segovia's hands and fingers seem to move of their own volition, yet all the movement is best characterized by the impression of stillness. Linked here is a video of Segovia, late in his life, still vibrant, playing Bach's Sarabande and Gavotte en Randeau. The video runs just over five minutes, but even a glimpse conveys an adequate sensibility of his mastery. And though stillness is commonly defined as an absence of motion, here its meaning is closer to an absence of unnecessary motion. Watching the performance, the impression is that all unnecessary motion---physical, mental, and spiritual---has been eliminated. A balance between suppleness and tension in all areas of a person's life seems to be the essential necessity of a life well lived. Segovia, by any standard, has achieved such a balance in his life. And if one considers most of the enduring philosophies and arts of the East, one will find that the lessons taught strive for just such a blending. One need only consider the pranas of yoga or the intricate movements of tai chi to see the validity of this position. When the balance is perfected, only the moment exists, conceptions blur and dissolve, and plurality becomes mere illusion.